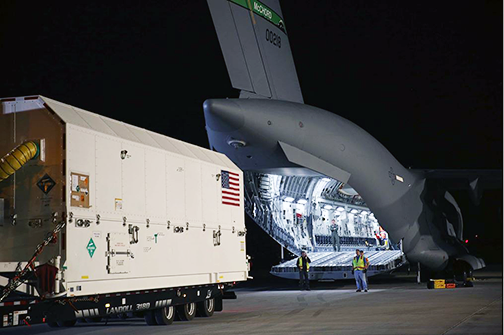 The first of the U.S. Air Force’s advanced new, higher-power, harder-to-jam GPS III satellites is en route to the launch pad. The GPS III satellite being loaded for shipment to Cape Canaveral. Photo is courtesy of Lockheed Martin. On August 20, Lockheed Martin (NYSE: LMT) shipped the U.S. Air Force’s first GPS III space vehicle (GPS III SV01) to Cape Canaveral for the satellite's expected launch in December. Designed and built at Lockheed Martin’s GPS III Processing Facility near Denver, the satellite was shipped from Buckley Air Force Base, Colorado, to the Cape on an Air Force C-17 aircraft. GPS III will be the most powerful and resilient GPS satellite ever placed on orbit. Developed with an entirely new design, for U.S. and allied forces, GPS III will have three times greater accuracy and up to eight times improved anti-jamming capabilities over the previous GPS II satellite design block, which makes up today’s GPS constellation. GPS III also will be the first GPS satellite to broadcast the new L1C civil signal. 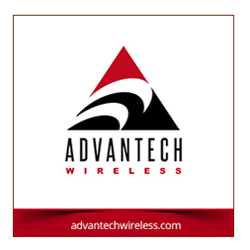 Shared by other international global navigation satellite systems, such as Galileo, the L1C signal will improve future connectivity worldwide for commercial and civilian users. The U.S. Air Force's first GPS III satellite, GPS III Space Vehicle 1 (GPS III SV01), has finished all space vehicle functional testing and been placed into storage ahead of its launch. 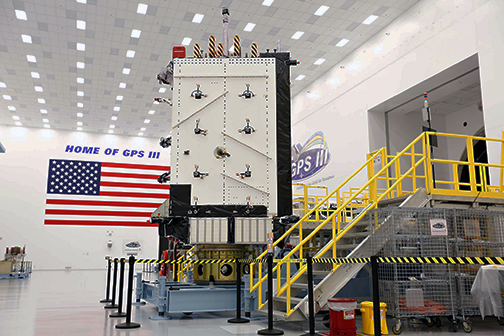 GPS III is in full production, with 10 satellites under contract, at Lockheed Martin's GPS III Processing Facility near Denver. GPS III SV01 is the first of ten new GPS III satellites under contract and in full production at Lockheed Martin. Johnathon Caldwell, Lockheed Martin’s program manager for Navigation Systems, said that once on orbit, the modern technology of this first GPS III space vehicle will begin playing a major role in the U.S. Air Force’s plan to modernize the GPS satellite constellation. Lockheed Martin is bringing GPS III’s new capabilities to the world and the company is to continue to serve as a valued partner for the Air Force’s positioning, navigation and timing mission systems.